This is a great transition carseat. I looked at some of the other popular and highly rated brands/models but really liked the Peg. We had the infant seat and were happy with that one too. The Peg is highly rated and looks much better when you see it next to some of the others. The plastic looks really cheap on the others and just really bulky. The Peg has a small footprint and fits nicely in a small car. I like the recline while rear-facing and the tall adjustable headrest. I really love the holdback restraints for the straps. Genius! The seat sits up high and my baby can look out to see. Very happy with it and would recommend to others! ProsThe way it looks, quality, features, brand reputation. After doing a lot of research and speaking with emergency professionals (EMS workers, police officer friends, etc), we decided this was the best car seat option for us when it comes to safety. Albee had so many color combinations which is what initially led me to purchase from them. The Paloma color is incredible in person and just the cherry on top when it comes to all other features the Primo Viaggio has to offer. Placed my order and it was shipped later that day! My babies had their brand new car seats in such a short amount of time that I thought it was a fluke. Ordered a few other baby items from Albee and ran into equally amazing shipping and every product has been top quality. I wonâ€™t be shopping elsewhere for baby items any more and am so thankful they had this top rated car seat in so many color option available and ready to ship. 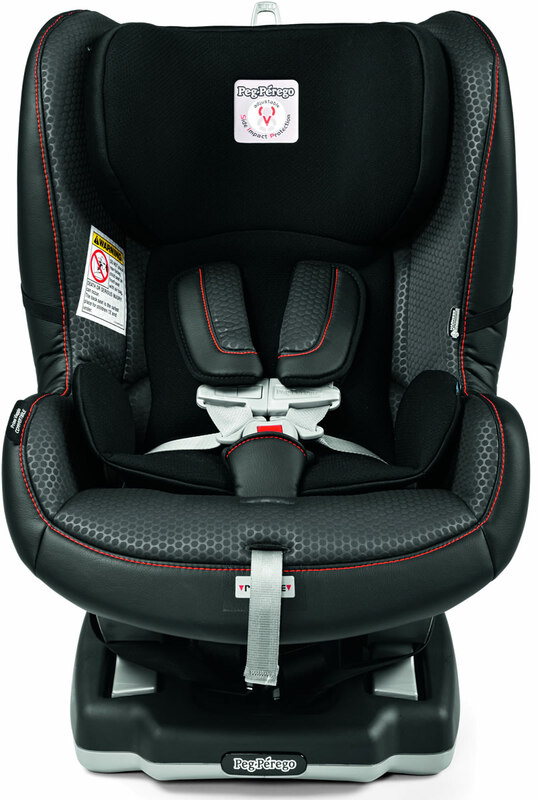 This is our second Peg Perego convertible carseat. My parents drive a BMW 3 series, which has a smaller backseat, so we were looking for a carseat for them with a more compact footprint (my husband and I have the Clek Foonf and Fllos as well as a Nuna Rava in our cars, for comparison...we love them but they're too big for my parents' cars). The Peg Perego checked all the boxes - smaller footprint, easy to get our boys in/out (you know how some carseats have a very deep seat? we wanted to avoid that as we knew it would make it difficult for my parents given their car, particularly as the boys got bigger), easy to install and adjust, and comparable quality to our Clek and Nuna carseats. Really, we couldn't be happier. I like peg perego car seats. This is my #3 car seat. Pretty comfortable for my little one to seat during the trip. second time to purchase this one. it is very comfortable for our little one. If you are on the fence - get this! After doing tons of research on different types of carseats (first time Mom over here), I finally pulled the trigger on the Peg Perego. Aesthetic: love the aquamarine color and curves of the seat. Ease of installation: I read the manual thoroughly and watched a tutorial video to ensure I wasn't missing anything. For reference, I drive a Volvo S60 which has contoured backseats (not flat) - all I needed was an old towel to help make the seat level. I did opt to use the latch system & the tether - the seat doesn't budge AT ALL. Also, the seat itself isn't very heavy which was a pleasant surprise. So far I'm really pleased. If you are looking to purchase - get this!! My son love this car seat. Just transitonal him into a booster. High quality material & very cushion seat. Love it. Albee Baby has the best deal and this car seat is so comfortable for my little one! Will be buying another for my husbands truck. I loved this car seat for my toddler so I bought a second for my 15month. Works great & easy to install both rear or forward facing. I did have to use towels under the base in rear facing position to help with the incline. Material doesn't make them sweat in the heat & I can easily take the cover off & on to wash. I use the infant insert for my 15 month (17lbs) so I'm not sure I would trust this with an infant...prob too big. I'd stick with an infant carrier car seat until at least 1yr. Overall it's a great purchase that I'd recommend. This car seat is wonderful. It is very stylish and safe. My daughter is very comfortable in it and the latch system is great and I like the extra tether option. The only problem is that it is not the most common car seat so some people are unsure how to install it. The best convertible car seat for this price! compact size, easy to install. We have had this carseat for well over a year and the extra money for the leather has been worth it for the easy cleaning. This seat is more difficult to install than others but has not been a problem for us. ProsEasy to clean. Comfortable for child. Easy to maintain rear-facing. ConsMore difficult to install than I would like. We have been using this car seat for two years now for our son. We absolutely love it. We have no complaints about it. It's sturdy, safe, comfortable, converted as he's grown from newborn to toddler, and it's very nice looking. We just bought a second one for our soon to be daughter. My sister has used two for her two children and my mom has now bought three to put in her car for her grand children! Our whole family loves this car seat. ProsSturdy, safe, comfortable, convertible, nice looking. Made in Italy. I love this name brand! I have their high chair and just purchased this car seat and love it for my daughter! It fits her so well and she is so comfortable in it, and of course all the safety features that come with it was why I chose it first. You will be very happy with this car seat. It is expensive, but very well made, and comfortable. We took it with us on a trip to Florida, and it was easy to transport through the airport and install in the airplane seat. It is great that it can work as both a rear- and front-facing seat, which makes it more versatile and last longer. This car chair looks gorgeous! This chair beautiful, comfortable and stylish. Before we have maxi cosi for infant, but this chair so beautiful, so I decided to buy. It not cheap, but it worth every dollar. I love this car seat and so does my son! Is not to wide, it reclines the perfect amounts, and is cery comfortable! Our baby's head size is in the 90th percentile. Considered either Chicco or Maxi Cosi but they both seemed either too deep or tight. Baby looks comfortable in Peg Perego so we decided to keep this one. ProsThe head rest area is not too deep like Chicco and not too narrow or tight like Maxi Cosi. Baby seats higher in Peg Perego so he gets better window view. ConsExpensive. 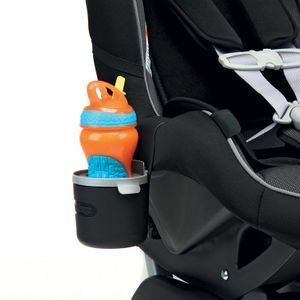 Peg Perego cup holder's quality doesn't match to the car seat. This is the 3rd one we have bought now because we like the seat so much and we need a seat in a few different cars. Tried others and keep coming back to Peg Perego products. It is easy to use and the quality is outstanding. Did a lot of research to decide on this car seat. 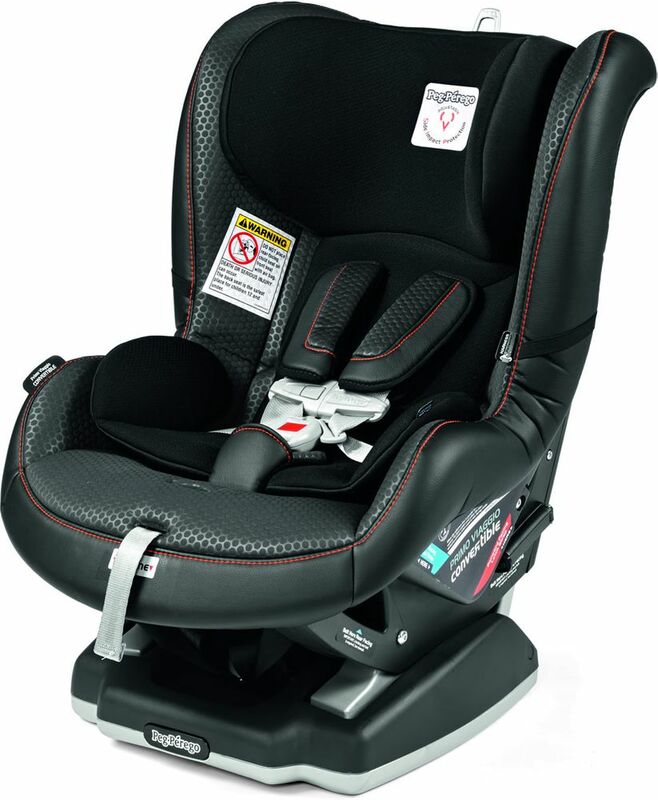 It has high safety ratings and very comparable with pricing to other car seats. The leather is very nice, and my son seems comfortable in it. 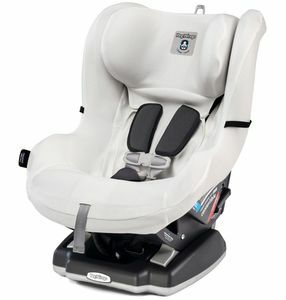 It was easy to install, I installed it with the latch installation and had it verified by a car seat safety technician. 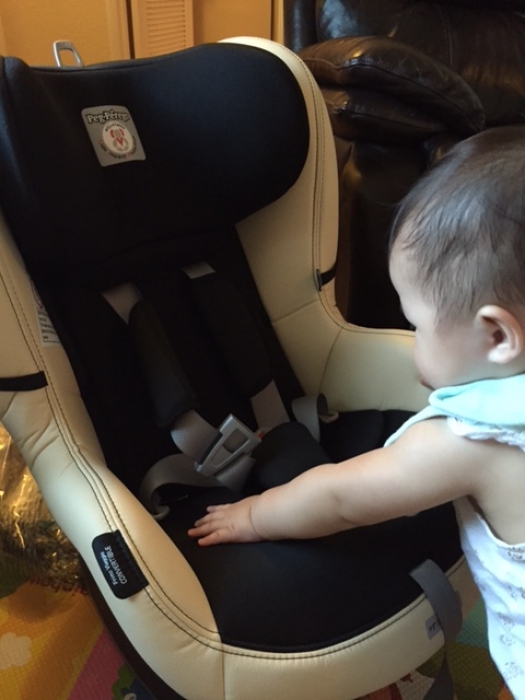 She commented that this was one of her favorite car seats based on its safety and ease of installation. Highly recommend! My favorite seat. This is my second one for my second child. It's comfortable, looks great, and it's made in Italy. Very easy to use and install. My kids love it. We bought this car seat a couple of years ago for our daughter and now again for my son because we just love it so much. Both kids like it as well - they never complain about going to the car, they can easily play with toys on their lap or sleep good long naps in it. I really like the detail that the straps can be held wide open so you can sit the child in without any strap fuss. Its expensive, but so worth the price. Love this carseat! It is easy to install and use everyday. The strap is easy to unbuckle and buckle. There are clips on both sides in order to pull the straps apart and put the baby in the seat. Absolutely love this car seat. We have about 6 car seats spread across the country (2 at each granparents, and 2 at home). The 2 at home are both Primo Viaggio car seats and are by far the easiest to install with the Latch system. Great design and aesthetics and great safety ratings sold us on these. Great Seat, worth the money! Great, safe seat! Offers a lot of room and comfortable for child without taking up too much room in the car. 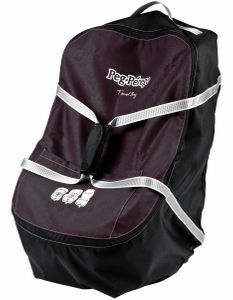 It's easy to loosen and tighten straps, make it super easy to take child in and out of car. This is a great seat to consider! The best car seat ! Thank god I discovered albeebaby!!! I got the concert able car seat which I always wanted for my son. I was using a gracco travel system for the longest time and my son totally outgrew it. And I loved the peg perego convertible car seat ! It's amazing! I no longer have to worry about his head falling downwards, he now has support on both sides!!! my daughter loves the seat and it's easy for both me and my husband to buckle. Very substantial seat that had been recommended by many friends. I bought this same seat for my son at 6m old... He's still in his & I love it so much I bought one for my daughter. Sturdy, comfy, washable, durable! Very roomy for my baby but doesn't take up the entire backseat (I drive a Volvo XC90). The material looks like it will be very easy to keep clean. Love the color! Fun but could easily be used for a boy or girl. Very easy to install. Myonly complaint is that I do wish it reclined a little more. We originally purchased this convertible seat as a second option to our Diono Ranier. After using both on our 16lb, 6 month old, the Peg is our FAVORITE. The head support and higher sides are much better than the Diono and I do not have to worry about her neck falling over IF she happens to fall asleep during long car rides. The only complain I have is the long harness pads. They make it difficult to keep the harness clip on the correct chest level. ConsThe only complain I have is the long harness pads. They make it difficult to keep the harness clip on the correct chest level. We purchased this seat in the Alcantara and absolutely love it! It is easy to clean, and best of all, keeps our 15 month old cool on these 110 degree days! I love the strap holders on the side, makes it so easy to put him in. I highly recommend this seat to any and everyone!! I purchased this carseat for my newborn baby so that she could use it for more than just a year. It's very easy to use and adjust! Would recommend to anyone looking for a carseat that grow with their child. 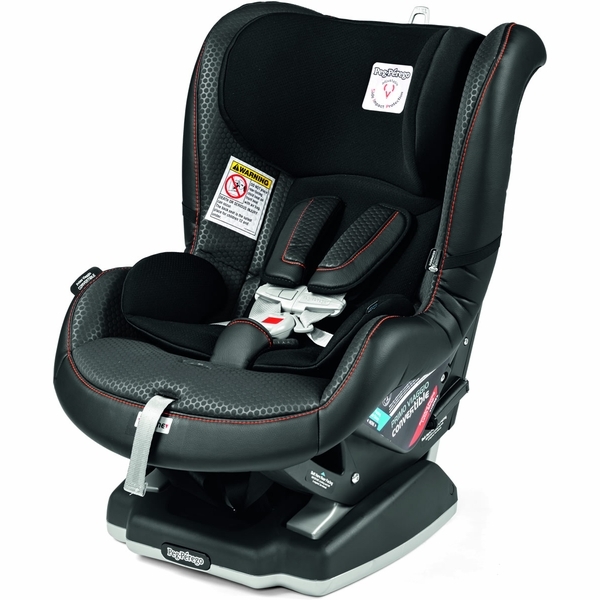 Peg Perego quality is unmatched in the convertible car seat market. The material is top quality, the stitching is tight and the material doesn't wear down or sag over time. We purchased two of these car seats (2 car family), that's how much we like them. The reason for a 1 star deduction is that I found the recline feature to be very tough to engage. With both seats, I've struggled with this so it is definitely a design feature. Only after much wrangling can I get it to recline. Also, the button to release the straps is really basic. This is just a design preference. With such a high end car seat design and price, I expected a little more thought to go into this feature since you use if every time a child is unstrapped. Chicco Keyfit and Nextfit car seats do a much better job with the yellow release button, in my opinion. We are really happy with this choice. The seat meets all the high I did loads of research around safety and narrowed down to 3 seats but chose this because it looks nice too! It arrived in the Panama colour that I'd only seen online and we couldn't be happier. It looks great with our cream leather seats. And baby is loving all the extra space after the infant seat size! Just got our Peg Perego convertible car seats in Paloma today and they are so nice! Love the look and the quality of this car seat. It was really easy to figure out and to install them using the latch system in our car. 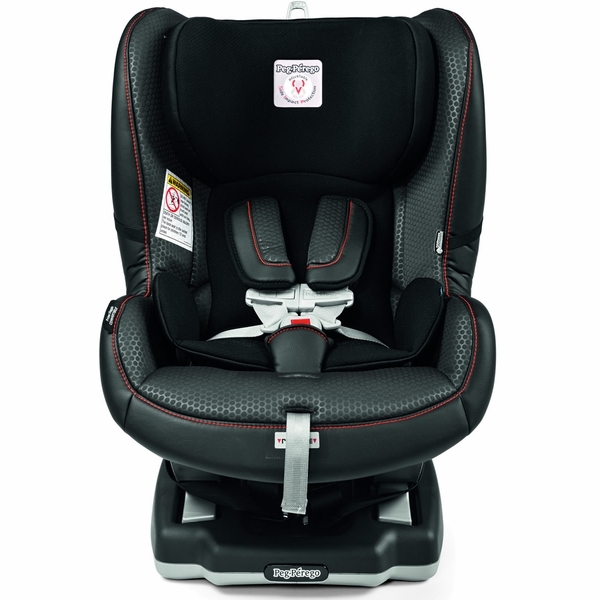 It is so comfortable, and fits my twin one year olds perfectly rear facing. They looked so relaxed and comfortable in them. So glad we paid extra to get the leather, it adds such character and matches our car great. Really love this car seat already. 12 month old loves this! Great quality, easy to install, roomy, soft and seems comfortable for baby. He can see out the window now! Like the sweat wicking jersey material and love the elastic seatbelt holders on the sides! We absolutly love this seat and so does my 3 year old! It's very comfortable, easy to install, easy to adjust and a very attractive looking seat. Worth every penny! ProsEasy to use, attractive and vey safe! Easy to install. Super comfy and not bulky like most convertible seats. my baby is loving this car seat. he looks much much much more comfortable in this car seat, and also the car seat looks so luxurious! !also install was super easy and super fast!.the best thing about this car seat is the little rubber band on the sides that holds the belt when baby is not in the car seat. that helps so much when putting the baby in to the car seat.i wish i can fit into that car seat, it looks like a my baby's personal sofa in the car.love love love it!! I purchased a Britax convertible when my oldest (who is now 10) which I loved. When I became pregnant with #2 9 years later I thought I would buy Britax again but was I wrong. Once I found out that Peg Perego made a convertible seat, I was all over it. It was easy to install. My petite 17 lb 1 year old loves it. Easy to get her in and out and tightens completely. The 5 point harness doesn't cut across her thighs, as did when I tried the Britax. So happy with our purchase. Great car seat! We've learned that you get what you pay for! Quick shipping! We'll definitely purchase from Albee Baby again! ProsGreat seat for warmer climates! Easy install. We love this seat. It was easy to install, great safety ratings. I did a ton of research and this was the best seat for us. It fits nicely behind front seat in rear facing. Our son seems to love it to. Very nice car seat. Installs easily. Not too deep, takes up the same amount of space as my son's infant car seat when fully reclined. He seems comfortable. Easy to adjust height with straps that don't require re-threading. Plus, it matches my leather seats! My son loves his new Peg Perego car seat. It is spacious, cushioned, and at a great angle for him to play with his toys or sleep. 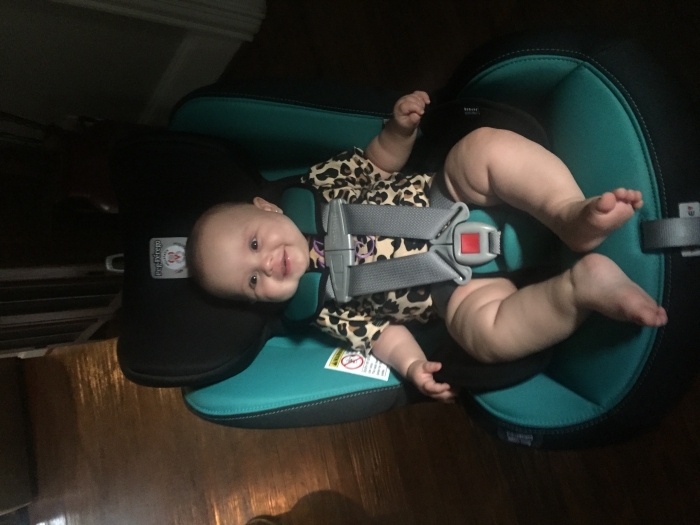 Just switched my 10 month old to this seat from her infant one and I love it. So easy to install, nice fabric, sleek looking, easy no rethread harness adjustment and obviously most important it gets great safety reviews. Really happy with our choice. Grows with your child so you can keep them rear-facing longer, up to 45 lbs. The rear-facing recline ensures baby's comfort. Easily switches from rear to forward facing for use from 5 to 65 lbs. The wide padded seat includes a specially shaped, removable cushion for newborns to be used until the baby reaches 22 lbs.